This book marks the centenary of Neil MacLeod's death in 1913 with the republication of some of his work. 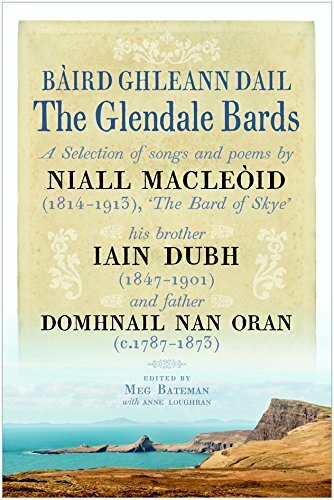 It also publishes for the first time all of the identifiable work of his brother, Iain Dubh (1847 - 1901), and of their father, Domhnall nan Oran (c.1787 - 1873). Their contrasting styles mark a fascinating period of transition in literary tastes between the 18th and early 20th centuries at a time of profound social upheaval. Neil Macleod left Glendale in Skye to become a tea-merchant in Edinburgh. His songs were prized by his fellow Gaels for their sweetness of sentiment and melody, which placed a balm on the recent wounds of emigration and clearance. They are still very widely known, and Neil's collection Clarsach an Doire was reprinted four times. Professor Derick Thomson rightly described him as 'the example par excellence of the popular poet in Gaelic'. However, many prefer the earthy quality of the work of his less famous brother, Iain Dubh. This book contains 58 poems in all.